By some accounts, the U.S. National Debt is so high enough now that even if we wanted to pay it off, everyone in the country would have to chip in a whopping $30,000 per person! This is based on a 9.3 trillion dollar debt divided by 303 million people. Since only about 143 million of us are employed, a realistic number would be considerably higher. UPDATE OCT 5 2011: A scant 3 years since this original post, the total debt is $14.7 trillion and counting. But, what was also shocking is that now the debt divvies up to $47K per person! And its way higher if you are a taxpayer. Debt Held by the Public. “The Debt Held by the Public is all federal debt held by individuals, corporations, state or local governments, foreign governments, and other entities outside the United States Government less Federal Financing Bank securities. These sum of these two parts is subject to the periodically raised Federal Debt Limit. 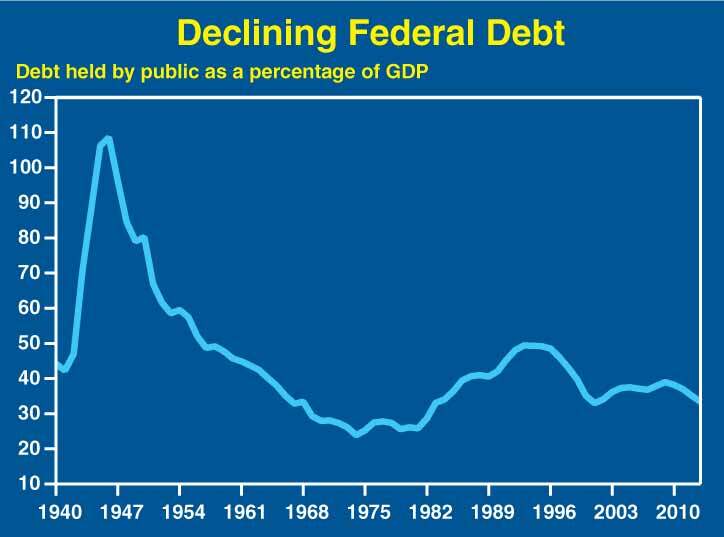 For a nice paper on federal debt limits by the Concord Coalition, see here. Anyway, this got me thinking: As a Citizen CEO, I would be expecting my President and government to give a clear accounting of this problem. So, I went to the White House website and, sure enough, uncovered the President’s fiscal outlook for 2009. The White House paints a somewhat rosier picture by only considering the $5 trillion “debt held by the public,” which is not only decreasing but historically low as a percentage of GDP. Rather than a part of the public debt, the White House casts the intragovernmental debt as stream of increasing future payouts. Consists of trust fund accounts that are credited with dedicated revenue such as Social Security and Medicare payroll taxes (FICA). 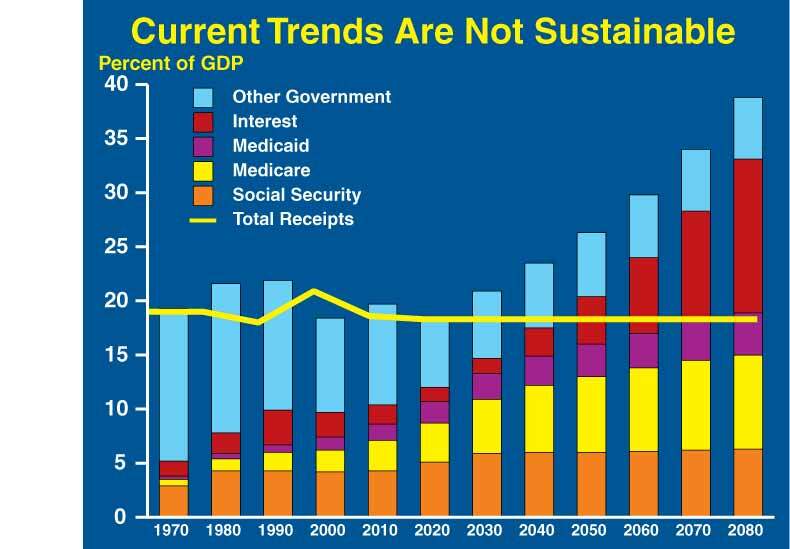 In theory, surpluses in these accounts are “saved” for future benefit obligations… This debt increases automatically every year by the amount of trust fund surpluses invested in Treasury securities, regardless of whether the budget is in surplus or in deficit. For example, in every year since 1984 the Social Security program has generated a surplus – the federal government has collected more payroll taxes than it needed to pay current benefits…As Social Security surpluses grow, so too does the Social Security Trust Fund, and intragovernmental debt rises. Thus, unlike debt held by the public, growth of intragovernmental debt does not reflect an imbalance in short-term fiscal policy. It represents a very different problem: growing long-term obligations that future taxpayers will have to pay for when the Treasury ultimately has to transform these bonds into benefits. While I don’t think the Bush administration is above spinning a story, treating intragovernmental debt as a stream of future payments might enable a better focus on the real problem. That is, while increasing debt tends to invoke assumptions about government overspending, the reality is that the government is caught in a vicious circle (reinforcing loop in systems thinking terms) of increasing costs for both interest and Medicare payments. 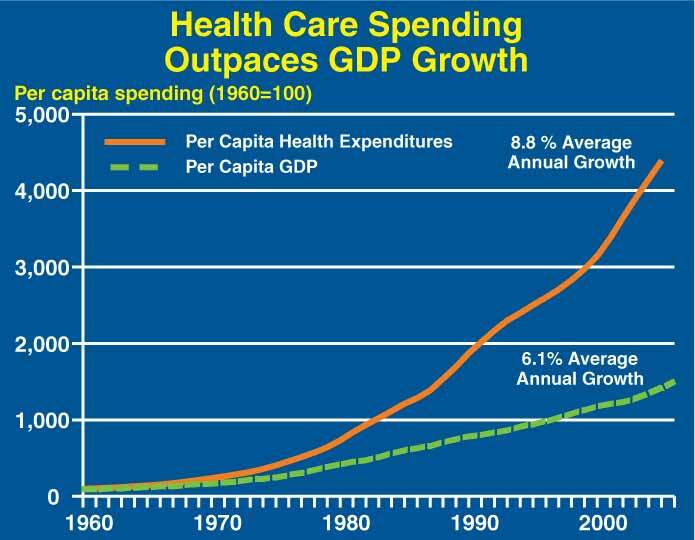 This growth in overall health care costs is particularly problematic for the Federal Government because it is the Nation’s largest purchaser of health care, accounting for approximately one-third of all health care spending in the country. The Government provides health care to seniors and low-income individuals through its two largest health care programs, Medicare and Medicaid, and to veterans, active duty military, and civilian personnel through a number of other programs. In 1966, Medicare and Medicaid accounted for only 1 percent of all Government expenditures, but now they account for 20 percent. The Medicare program’s Board of Trustees assumes that Medicare costs will continue to outpace overall economic growth by an average of 1 percent per year over the next seven decades. 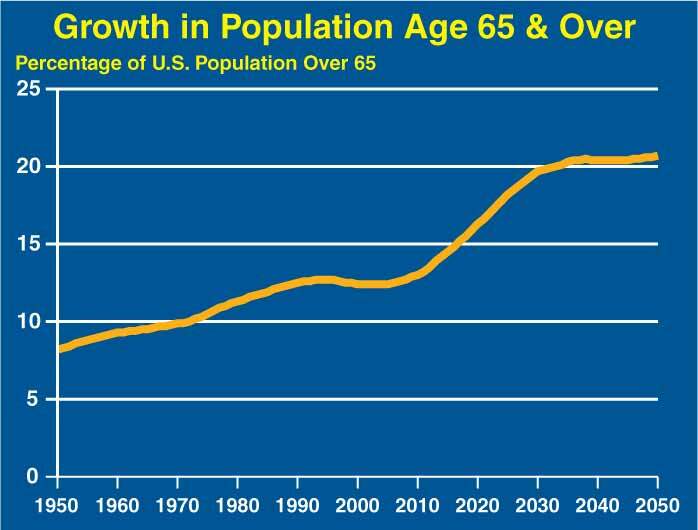 This problem is compounded by the fact that an increasing number of Americans are reaching retirement age and living longer. This is clearly an dire problem, and there is little debate that it exists. There are many views on how to addres it, but all commentators agree that it is a huge problem. What is alarming is that there seems to be so little interest in it from the public or the news media.